Early last year, I worked on an experimental documentary film. 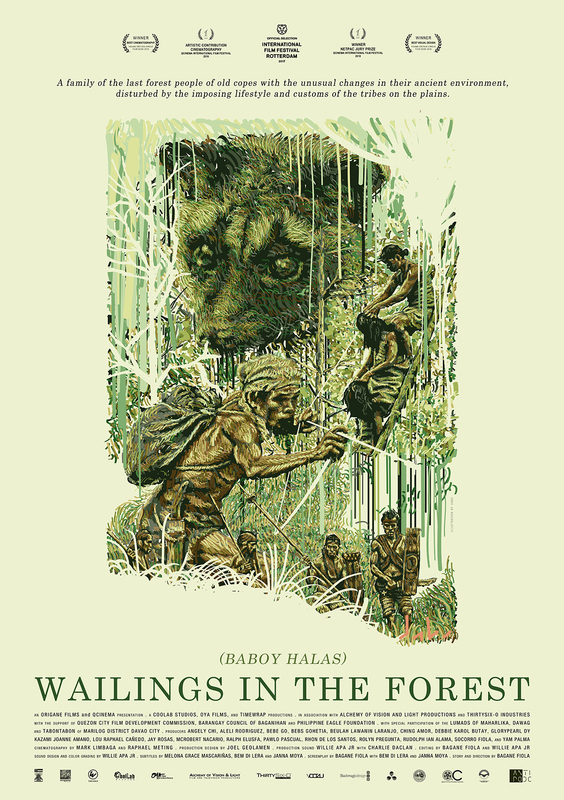 It was during the early phase of its production that the conception of “Wailings in the Forest” was developed. On our first day of shooting in Mindanao, the southern part of the Philippines, I was fortunate to have listened to a wonderful fable told by a former rebel commander. He seemed to have mastered the art of telling the story of his Moro ancestors, passed on through a lyrical poem sang in their native tongue to each generation before it was written in Arabic in the 50’s. The first part of the fable really lingered in my mind. It is the story of the origin of their clan; how their first father was impassioned to wake up every night just to fall in love with a beautiful nymph, which only his eyes can see. To others, the nymph appears as a mere pig. Though “Wailings in the Forest” is a different story, I think it represents cultures beyond that of the Moros’, for boar hunting is a common practice of the Lumad (the indigenous people in Mindanao), such as that of the Matigsalug tribe. I feel honored and excited that the film “Wailings in the Forest” will be having its international premiere in the prestigious 46th International Film Festival Rotterdam. I commend the filmmakers who, for 17 days, over 400 hours, roamed and braved the rainforest of Maharlika—one of the last forests in Mindanao—to capture beautiful and untamed stories that nature has provided us. With the blessings of Manama (god) and the guidance of the tribes people, the “Wailings in the Forest” lives on as we share it to the world. Matigsalug tribe is one of the 18 Lumad—indigenous tribes in Davao City, Philippines. “Matigsalug” is a term which means “people along the Salug River—now called the Davao River”. The Matigsalug, in earlier years, practiced a hunting-and-gathering lifestyle with minimal agriculture efforts. Very recently, by the influence of migrant farmers and businessmen from northern Philippines and the island provinces, the Matigsalug shifted to sedentary land cultivation with more or less permanent villages. What remains of their earlier lifestyle is now found in their cultural and artistic expression. This is evidenced by their costume of bright colored mid-rib blouses and short skirts, and with skillful hunting and gathering techniques. This early lifestyle is also shown in their music, songs, dances, poetry, epic, and spiritual expressions. A family of the last forest people of old copes with the unusual changes in their ancient environment, disturbed by the imposing lifestyle and customs of the tribes on the plains.